Mosquitoes · Ticks · Carpenter Ants · Silverfish · Fleas · Bed Bugs · Rats · Mice · Bees · Wasps · Roaches · Springtails · Carpenter Bees · Earwigs · Stink Bugs · Termites ... and many more! Accurate Termite & Pest Control Co., Inc., is a family-owned business, that proudly opened its doors on February 19, 1989. Since that day, our goal has been to provide quality pest control services at a reasonable price. We have been doing just that for over 28 years. Carpenter ants belong to the class of insects known as Hymenoptera, which also includes bees and wasps. Carpenter ants derive their name from the appearance of their nesting galleries, which are smooth, clean, and sculptured. Unlike termites, you will find no dirt, excrement, or sawdust in their nests. Although it may appear that they eat wood like termites, carpenter ants are not able to digest cellulose. Instead, they prefer to eat insects and decaying fruits. Should they decide to invade your home, they will feast on most anything you eat, including sugar-based products, butter, and even steak. 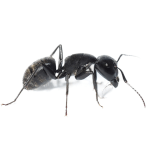 The important question regarding carpenter ants is: why do they invade homes? Some species of carpenter ants prefer the outdoors while other species are prone to infesting structures. If ants decide to nest outside, they will use places like hollow trees, rotten stumps, firewood piles, or soil beneath fallen timber. When they invade a house, they probably get there one of two ways or possibly both. A founding queen may start her colony in a building and the budding population may take several years to become a noticeable problem. The other primary means of structure occupation is when a mature colony takes up residence in a susceptible structure in a wooded area, which is usually adjacent to their existing nest. With Accurate, you have access to our on-staff entomologist that can answer any and all your questions. As an Accurate customer you have online access to all your service information including materials used and service reports. Here at Accurate we value our environment. Which is why we are committed to offering green treatment opportunities. Accurate is committed to innovation. Which is why we offer the latest technology and tools to get your job done right. And get access to exclusive coupons!